As our district's writing coordinator, I don't have a classroom of my own, so I don't always get to try out some of the new ideas I hear about in my land of professional development and inspiring conversations. I have been doing a lot of work this year about inquiry in the classroom, so I am constantly on the hunt for opportunities to get students asking questions. Today, I tried out a read aloud in a grade 3 and grade 4 classrooms where I had students ask the questions, rather than me. It was great. Here's a chart I shared with them to support some of them as they worked to formulate questions. I explained to them that we help out students with thinking prompts in workshop instruction, and we can also offer some support to help students become better questioners. Write down three to five questions you are having. Choose the most interesting question. Write down three to five questions that all relate to that one question. If you want an extra challenge, begin the second round of questions all with "What if?". You will be surprised and amazed at the deep thinking that happens, and you will love the engagement levels! Love this --the questions are so much better when they generate them! It is great when you find those classrooms that you play in as a coach - we too need the time to learn just for ourselves. Look forward to connecting this month through slice! Thanks for this post reminding me of the importance of questions. Great chart and reminder. 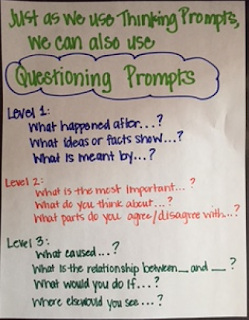 We have tended to go toward the thinking prompts, but questions renew thinking and uncover places where readers and writers need to venture. Love it when students do the questioning! What a powerful strategy! Thanks for sharing! Oh, I am totally stealing this - brilliant! Thanks for sharing your expertise with us, Melanie! I don't know Cheyenne Again by Eve Bunting, but I think I need to get it asap. Eve Bunting's books must help the students understand how much more deeply they can go through the questioning you shared, Melanie. This is great. It reminds me of asking, "and then?" I'm always amazed at the depth of questions kids ask when we give them the opportunity. Thanks for sharing, Melanie!